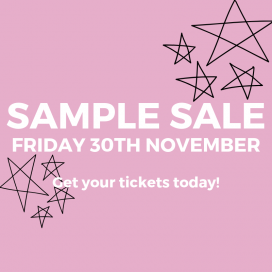 Shop for lingerie, nightwear, and leisurewear for women at reduced prices at Intimate Lingerie Sample Sale. Brands included are Ralph Lauren, Kate Spade, DKNY, and Hanro of Switzerland. Take up to 70% off on women's apparel at the Lorna Jane Sample Sale. Shop for handmade rugs at reduced prices at the Luke Irwin Sample Sale. Nichole De Carle London will be hosting a Sample Sale featuring women's lingerie at reduced prices. Shop for women's apparel at reduced prices at the Preen Sample Sale. Shop for women's footwear at reduced prices at Air and Grace Sample Sale. Shop for women's apparel at reduced prices at Bella Freud Sample Sale. 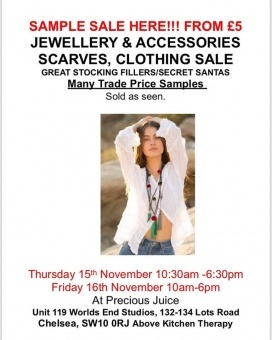 Shop for knitwear and shirts for women at reduced prices at the In.no and Ilse Jacobsen Sample Sale. Designer Matthew Miller yearly Sample and Archive Sale taking place at the end of this month from Friday 30/11 until Sunday 02/12. Both Cash and card accepted. 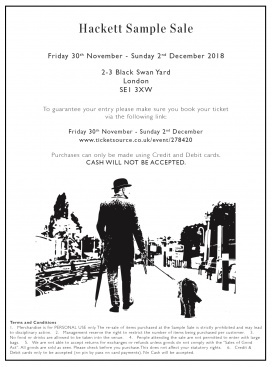 We request that you purchase tickets to attend via the website link- There will be 1 hour time slots (45 mins to shop and 15 mins to pay and exit), these will be very strict to maintain no queuing or disruption to local businesses/residents. 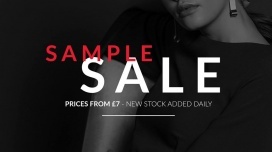 Shop for tops, trousers, and skirts at reduced prices at Closet London Sample Sale. Price ranges from £7 to £15. Take up to 70% discount on women's apparel at Ellery Archive Sale. Shop for women's apparel and accessories at discounted prices at The Shop at Bluebird Sample Sale. Brands included are victoria Beckham, Acne Studios, Forte Forte, Alexander McQueen, Golden Goose, and Isabel Marant. Shop for women's apparel, accessories, scarves, and jewellery at reduced prices at the Tribe + Fable Sample Sale. Shop for women's apparel at reduced prices at Paper London Sample Sale. Price ranges from £20 to £100.